Samsung Galaxy Tab S 8.4-inch model. Source: vendor. Samsung today unwrapped its new high-end tablet, the Galaxy Tab S, which the Korean company claims has the best screen available today. Two versions of the Galaxy Tab S will be sold - each running the Android 4.4 "KitKat" operating system - one with an 8.4 inch screen weighing 294 grams, and the larger, 10.5-inch model at 465 gram, both of which are 6.6 millimetres thick. In both cases, the Super AMOLED screen offers a high, 2560 by 1600 pixel resolution. This gives the smaller model a screen density of 441 pixels per inch. Samsung claims the Super AMOLED displays also have higher colour gamut for greater fidelity when displaying photos and videos, and a 100,000:1 contrast ratio. Galaxy Tab S 10.5 inch. The tablet will come with two different system-on-chip (SoC) parts depending on which market it is sold in. One variant will be equipped with Samsung's Exynos 5420 processor, which has eight cores, four of which run at 1.9GHz, and a further four clocked at 1.3GHz, based on the ARM Cortex A15. It also features the ARM Mali T628 MP6 graphics processor. Other markets will run the Qualcomm Snapdragon 800 quadcore SoC, clocked at 2.3GHz. Both SoCs feature 32-bit processors, unlike Apple's 64-bit A7 chip that is used in newer iPads and the iPhone 5s. Samsung did not say which markets will get the different processor, but in the past, the company has sold the octacore models in South Korea only. Storage is either 16 or 32GB, with expansion possible up to 128GB with microSD memory cards. The Galaxy Tab S will be sold in wi-fi only and wi-fi plus LTE models. The LTE connectivity has a unique 2600 and 850MHz combined frequency spectrum mode. 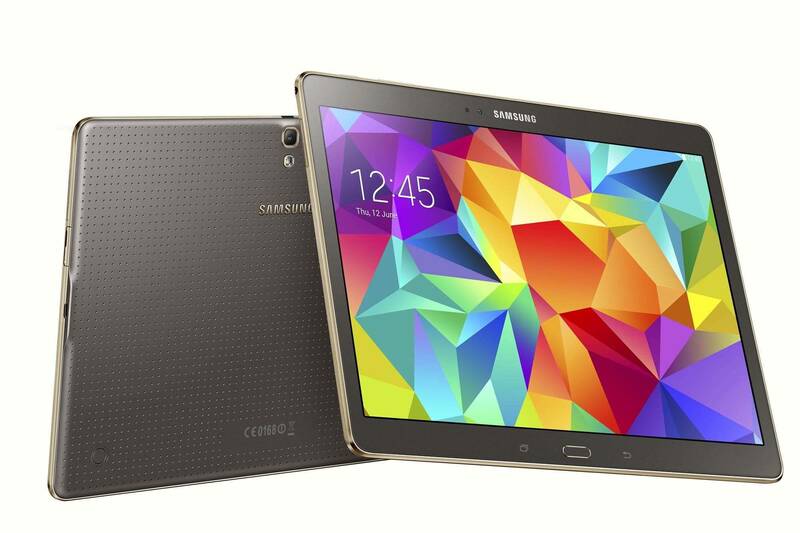 Users can make cellular calls on the Galaxy Tab S by connecting to a Samsung smartphone over wi-fi. Bluetooth 4.0 is also supported, as is 802.11ac wi-fi with multiple input, multiple output (MIMO) aerials. The device has 8 megapixel rear-facing and 2.1 megapixel front cameras, both of which can record in high-definition. Despite the large screen and multiple network connections, Samsung is promising up to 11 hours video playback from the 10.5 inch models's 7900mAh battery. The smaller, 8.4 inch Galaxy Tab S has a lower capacity battery at 4900mAh. A large software bundle comes with the Galaxy Tab S that includes games, entertainment and productivity apps as well as 50GB of cloud storage from both Dropbox and Box, for two years and six months respectively. Samsung declined to reveal Australian availability of and pricing for the Galaxy Tab S. In the United States, Samsung will start selling both in July this year, with the 16GB wi-fi only versions of both priced at US$399 for the 8.4 inch model, and US$449 for the 10.5 inch variant.